There is nothing I love more in life than a wintery recipe containing cinnamon, and this one, with light and fluffy sponge, drizzled with an almost glühwein flavoured caramelised sauce of cinnamon, star anise, orange, lemon, vanilla bean and pear, was simply divine. It is especially perfect on a cold, Autumn night, with a nice bottle of wine and some good friends. 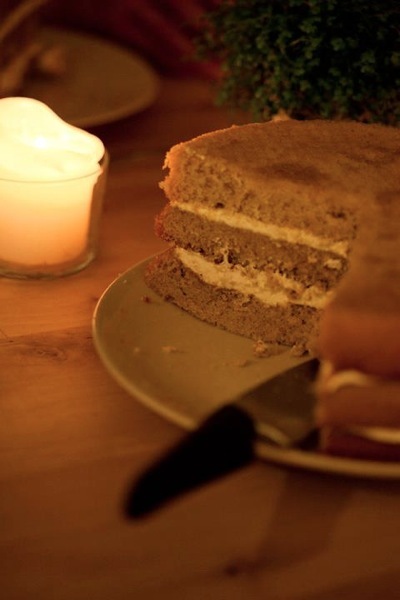 The recipe I used is based on the one found here although as you can see I made only three layers of sponge cake and as a result, made less of the crème fraîche filling. I also added some pear essence to the sponge itself – only 1/4 teaspoon for each layer, and when I make this again, I plan to use at least 1/2 a teaspoon per layer. Don’t be turned off by the sheer number of ingredients or steps, it is much more straight forward than it looks! 1. Preheat your oven to 180C. 2. I made the sponge three times as I don’t have an oven that can hold 3 cakes, nor do I have 3 cake pans. If you will also do this, then simply divide the recipe by three and make it three times so that the mixture is still light and fluffy by the time you put it in the oven. Whisk the eggs, sugars and the vanilla seeds (and pear essence if you have it) together until very light and fluffy. This will take around 10 minutes. Sift the flour and baking powder together in another bowl (3 times) and fold into the eggs mixture in two lots. Fold in the butter. Butter your cake tin (20 cm) and carefully pour in the mixture. Cook for 15 minutes. 3. Repeat step 2 twice more if you plan to make each layer at a time. 4. Whip the crème fraîche, cream, icing sugar and vanilla bean seeds together until light and fluffy. Leave in the fridge for later. 5. Peel, halve and core the pears. Add to a large saucepan the rinds, sugar, juices, spices, vanilla bean and seeds, along with 1 litre of water and once the sugar has disoved, add the pears. Simmer with a lid until the pears are tender, and then remove them to a bowl for later. Strain the liquid and simmer again until the sauce begins to reduce and thicken. Add in the butter, cream and desert wine and stir together. Add in the pears again to warm them. 6. Now it is time for the fun! 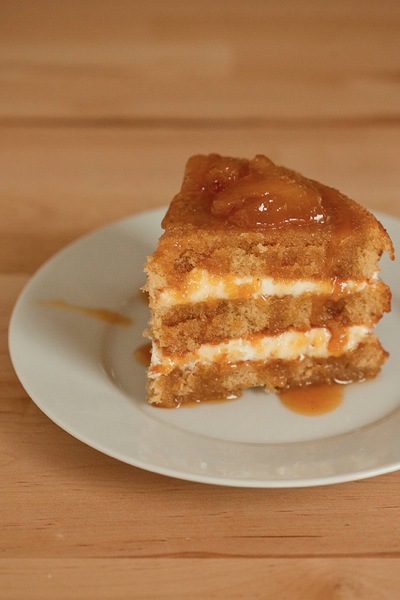 Build you cake, starting with a sponge layer, a little drizzle of caramel sauce, the crème fraîche layer, another sponge layer, repeat, etc. Once you have finished, drizzle the entire cake in your caramel sauce, and place the pears strategically over the top of the cake. 7. Cut and serve while warm. Enjoy! This looks and sounds amazing…. I plan on making this on a cold winter night and pairing it with a hot cup of glögg.. Sounds like an excellent plan. Suzanne can bring the glögg and I can make the cake for us all. My name is Michelle and I am an Australian living in Switzerland. I research, write and speak about identity and the experiences of people who have lived across multiple cultures. Read more here.